Monte Gordo is a purpose built resort and therefore has only a limited character. The main town centre is pedestrianised and this where you will find a large number of the restaurants and a selection of mainly tourist shops. The food is generally a very high quality and thought it was reasonably priced. Again there have more of a cafe feel about them rather a traditional restaurant. if you are on a Budget you might want to consider the tourist menu offered by many establishments. Monte Gordo beach was once a fishing beach where the fishermen hauled theirs boats up onto the strand. That all began to change in the 1960’s when the first hotels were built. 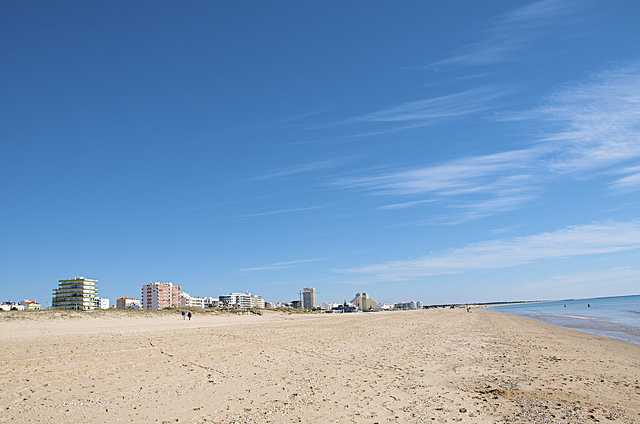 Now Monte Gordo beach is a resort beach, backed by a high-rise tourist town. It is the most commercial beach in the Eastern Algarve, so all facilities are on offer and there is plenty to do. Having said that, it is a very wide beach, so theres always some space for sunbathers, even in high summer. If you like busy commercial beaches, this is the place for you. If you don’t there are better places to experience the real Algarve .